As mentioned in my last post, I'm on a pretty heavy dress kick lately and this wild jasmine tea dress from MINKPINK is hands-down my favorite for Spring and Summer 2019. This is the second dress I bought with Palm Springs in mind. It's my first dress from MINKPINK but I'm so impressed by the quality and fit that now I basically want everything they make! I felt so comfortable in it that I wore it on the drive out to the desert, and then decided to stick with it for the remainder of our first day and night. It's light and airy, perfect for walking around the town and grabbing drinks at our favorite Mexican bar. I appreciate that it's fully lined for extra coverage, and the body of the dress has such a nice flow. The little flutter sleeves and deeper neckline give it a flirty feel without going overboard. I'm still able to wear a regular bra, but I did use a tiny bit of fashion tape as well since I brought it with me for my wrap dress. This dress has a generous fit so I would size down in retrospect, but my typical size was just fine for that carefree bohemian vibe I love. This Spring, I've been scouring the internet for little dresses that I can just throw on and go no matter the occasion. My lifestyle is fairly casual, but I still enjoy putting myself together and looking feminine - a dress is perfect for that. There are so many fun trends to choose from this year too; whether it's a midi length with buttons going down the front, floral frocks with layers of chiffon ruffles, long flowing maxis, or mini dresses with pockets and flutter sleeves. Trust me, I have several of these on my wish list! Living in SoCal, there's really no such thing as too many. One style that I've always admired but have shied away from is the wrap dress. They've never seemed very secure to me, and visions of the dress completely coming undone in public is the stuff of fashion nightmares! But, I've also long been told that a wrap-style dress is the ultimate in figure flattery and who doesn't want that? Why not give it a try? Featuring a tie-waist and an A-line skirt, it hugs your curves in all the right places. Beauty // Lips in L'Oreal "I Create"
I bought this adorable dress right before our weekend in Palm Springs. I love the long sheer sleeves and the ruffle at the hemline. It comes in a few different prints and colors but I opted for this orange hue because I like the warm tone with my dark hair. My only reservation is that I wish it had a snap closure because the neckline loosens up as you wear it, but that's not anything some fashion tape can't fix! I wore it out to dinner on our second night and I felt so feminine and curvy in it. I hope Diane Von Furstenburg would approve! Do you own a wrap dress? I'm not entirely converted but I DO think everyone needs just ONE in their wardrobe. 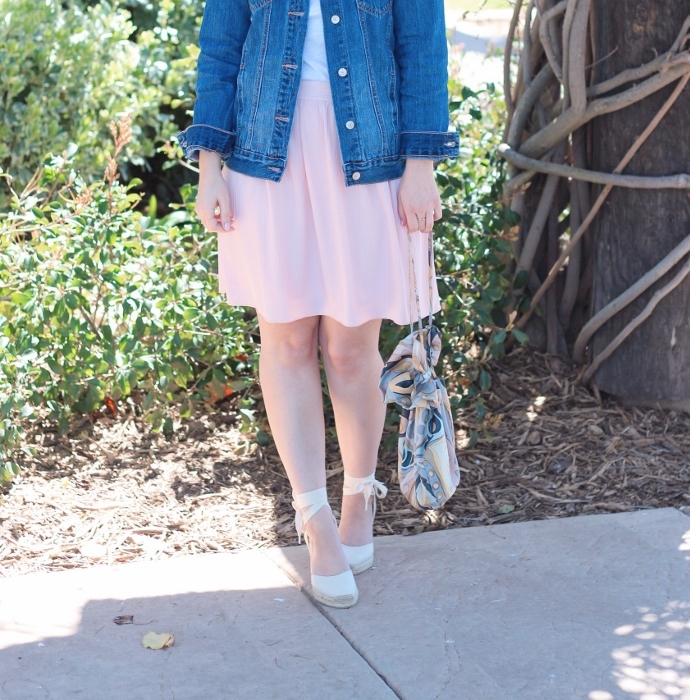 Linking up with Pink Sole today. The Riviera hotel in Palm Springs is truly an oasis in the desert. Located in downtown Palm Springs, it's incredibly convenient for exploring the surrounding area. You can soak up the sun and lounge by the pool during the day, and go listen to live music at night. I've stayed in a few different resorts over the years in Palm Springs, but The Riviera is now my favorite. In fact, we plan on making the trip an annual visit. Everything about the place exuded glamour, luxury, and relaxation. The resort is divided into sections, and each section is centered around the large pool and patio area. I loved all of the flowers blooming, as well as the shady trees and large palms that surrounded the property. The lobby of the hotel was gorgeous. As soon as I walked in, a citrus scent wafted through the air - it was honestly kind of intoxicating! I can still smell it as I type this. I also really loved the color scheme in the lobby area with white and pops of blue, green, and pink. I need one of those pink velvet chairs for my office! Everything was just so beautiful and well done. While compiling these photos, I realized I didn't take a single picture of our room! It was just as luxe as you'd imagine though. It felt private, the bathroom was spacious, and the bed was supremely comfortable. The pool/patio area was inviting and we spent a whole day there drinking and lounging. There was a nice mix of people, from couples looking for some pampering, to families with small children, and of course plenty of singles wanting to party. I really loved the variety. On Saturday, a DJ played music and everyone was dancing in the pool. If that's not your scene though, Sunday was more low-key although music still played through the loud speakers. We ventured out to eat for most of our meals but we did have breakfast at Cafe Palmetto. I got their eggs benedict and it was the best I've had! I think it was the hollandaise sauce that was so rich and creamy. It's a must-try! Nate and I did many of the same things that we did on our day trip last year, so I'm including that post in case you're wanting some recommendations for things to do and see! This post was not sponsored in any way - I mean, I wish! Hey ladies, happy Wednesday! I'm back from my long weekend in Palm Springs and I'm really excited to share pictures of where Nate and I stayed, what we did, and of course what I wore. It was one of the most relaxing vacations I've had. The beauty of going away somewhere relatively close to home is that it lets me recharge without the pressure of a bigger, longer vacation. Palm Springs is only an hour drive from our house and I've been there countless times so instead of cramming in a bunch of activities and sight-seeing, we mostly stayed at our hotel and lounged at the pool. I also took the opportunity to pamper myself a little. I brought some of my current favorite beauty products from home so that I could not only use them but also have pretty backdrops to photograph them. I've been using and loving all of these products for a couple months (or more) so I can fully attest to how good they really are! 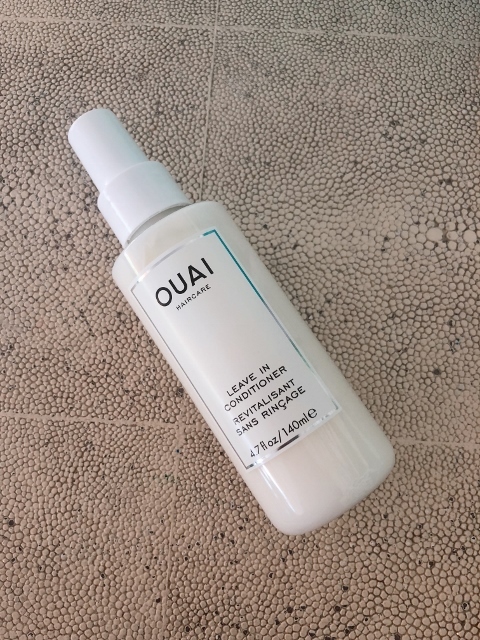 Ouai Leave In Conditioner is a multi-purpose product that I spray on my damp hair before blow-drying. It protects against heat, helps hair look healthy and shiny, detangles, combats humidity, and is formulated for all hair types. It also smells incredibly luxurious - if it came in perfume form, I would buy it! I also love that it doesn't have any sulfates or harsh chemicals. I don't use very many products on my hair, just this before heat styling and a couple oribe products in between shampoos. You have to try this! 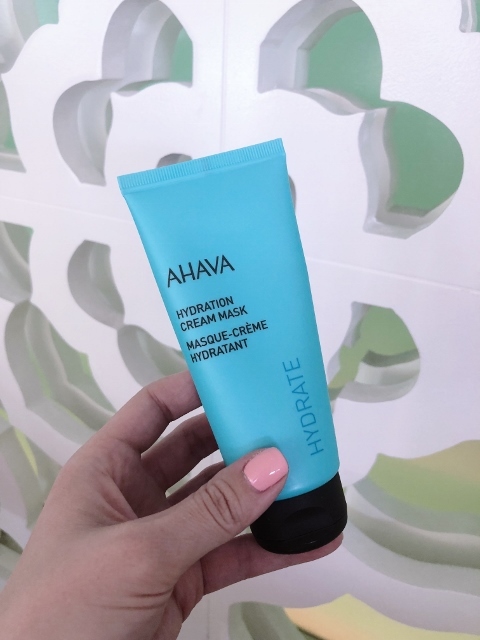 Ahava Hydration Cream Mask is a thick creamy mask I've been using twice a week. It contains Dead Sea minerals, shea butter, and other ingredients that help lock in moisture. Simply leave on for 3 minutes and rinse with cool water. Fast, easy, and great on the dry patches I get sometimes on my cheeks. 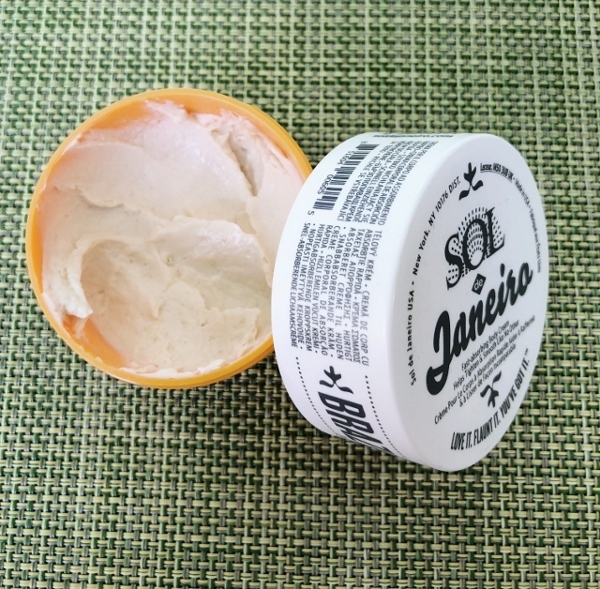 Sol de Janeiro Brazilian Bum Bum Cream has been a game changer for me. I originally tried their hand cream over Winter, and as soon as I ran out of that I decided to buy their signature bum bum cream. It contains caffeine and a blend of oils to help smooth and tighten. I specifically use it on my thighs, and while I know the results aren't permanent, it does make my skin look much firmer. Hey, anything helps, right? It also smells like a tropical vacation, so there's that. I'll definitely be using this all Spring and Summer long. 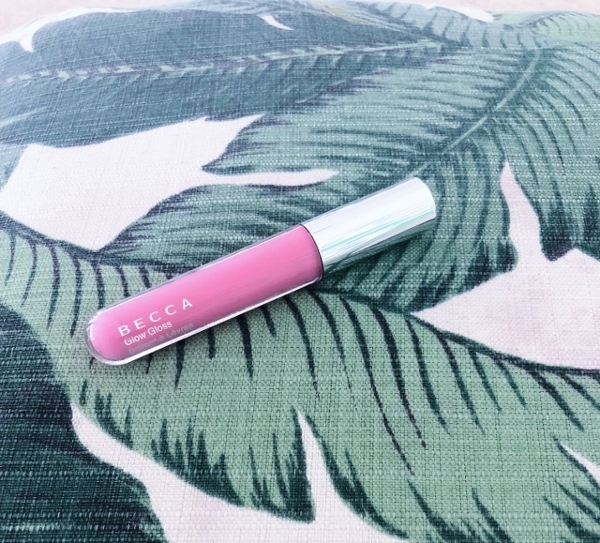 Becca Glow Gloss in Camellia is a cool-toned petal pink that makes my lips look fuller and well...glowy. I purchased my first tube last Summer and loved it so much that I bought another before Palm Springs. I'm not much of a lip gloss girl anymore (mostly due to the sticky factor) but the texture and formula of this gloss is so comfortable for everyday wear. I find that once the weather starts heating up, I crave a more minimalist makeup look and this is just the right amount of color and shine. Plus, it smells minty and this specific color makes teeth look whiter. Have you tried any of these products? What are some beauty items you're currently loving?